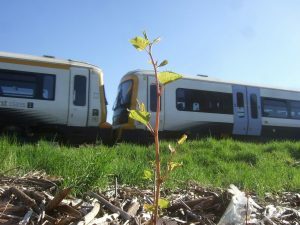 Phlorum, working with specialist knotweed litigators Charles Lyndon Ltd, recently provided expert witness services for a claimant in South Wales who was suing Network Rail for knotweed encroaching onto their property. The judgement, which was delivered in our client’s favour, was handed down earlier this month. The popular press has picked up on this “landmark ruling” (quoted by the Mortgage Finance Gazette) with the Mail on Sunday being quick to produce a story, as they had been closely following the case and attended the trial. So, what is all the excitement about, and how might the judgement affect our clients? The result will particularly resonate with anyone who owns land that could be affected by knotweed. It is now much more likely that the mere presence of knotweed close to a neighbour’s property will result in a successful claim for damages. For various reasons, the awarded cost for the diminution in value caused to the claimant’s property was relatively small, being £10,000. This is in addition to awarded costs for effective remediation of the knotweed and for any repairs to damaged structures that might be necessary. However, for more valuable properties, the award could be multiple times greater. no significant physical damage had been caused to the claimant’s property, so Network Rail argued there was no case to answer. As these defences failed, any landowner who has a large portfolio of land that hasn’t been properly surveyed could be in for a very nasty shock if a neighbour identifies knotweed that might affect them. Home owners, businesses and smaller property owners, who might be unaware of the risks that knotweed on their land might pose, should also be wary. The ruling shows that knotweed need not be located on a claimant’s property nor must it be causing physical damage to buildings and other structures for a legal claim to be successful. Clearly this is worrying for property owners. Due to the high relative cost of land and buildings, the impact of diminution in value effects, particularly for individual home owners, could be huge. This is shockingly and tragically illustrated in the relatively recent suicides, that have occurred, apparently due to homeowners’ irrational concerns about the effect of neighbouring knotweed on the value of their property. Thankfully, the solution to knotweed affecting property is usually a relatively cheap herbicide treatment programme, with appropriate insurance backed guarantees to satisfy most mortgage lenders’ risks. Being proactive and undertaking invasive species surveys as soon as possible can also help prevent nasty surprises and should be considered as part of sensible due diligence checks during any property transaction. Groundsure’s Japanese Knotweed Search is a cheap and easy tool that uses innovative remote sensing technology to survey large areas of land from your desktop. Plant Tracker is another great online resource that can help identify any recorded knotweed near your property (you can also upload records yourself from your smartphone). From our experience of supporting numerous land- and homeowners, as well as surveyors and other property professionals, acting for both defendants and claimants, Phlorum is uniquely qualified and experienced to help you with all of your knotweed concerns. Please get in touch if you have any projects that might benefit from our expert help; and if you think you might need to speak directly to a lawyer, give Charles Lyndon Ltd a call.